Wily pine martens are elusive animals, and you are often more likely to see their tracks or scats than the animals themselves. However they can be tempted to show themselves at feeding stations, so the hides at David Marshall Lodge are a great place to go for a glimpse of these beautiful chocolate brown and cream relatives of the stoat and weasel. As their name suggests their favourite habitat is a pine wood, where they make their homes in tree hollows or old squirrel dreys. They mostly venture out a night to feed on small mammals, birds, eggs or berries, according to the season. In autumn a tell-tale sign of their presence is the purply-blue scats they leave behind after feasting on blaeberries. In winter the best clue is often the distinctive tracks they leave in the snow. In firm snow these pawprints are about 4-5cm long, and often appear in groups of two or three as the marten jumps and bounds over the ground. 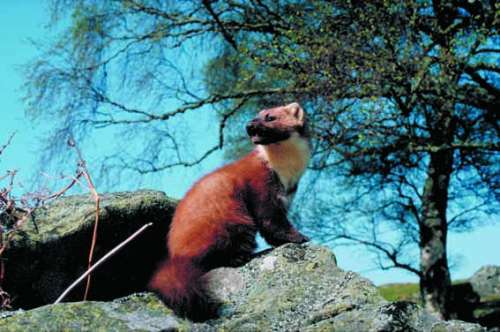 Loss of habitat and persecution nearly drove pine martens to extinction during the 20th century. 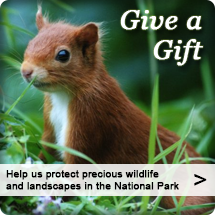 Happily the changing attitudes of land managers and better legal protection has meant they are now making something of a comeback, thanks partly to the efforts of conservation organisations in Scotland. Join the Friends of Loch Lomond and The Trossachs from as little as £20 a year and contribute to the future of this special place and enjoy our members exclusive benefits package.